Any requests for Day 3 of my 'CKEditor fixed' series? 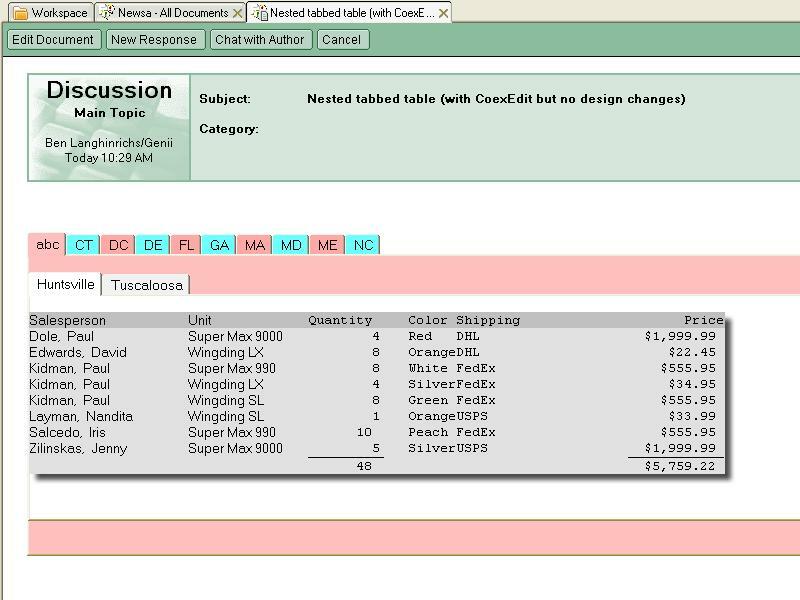 On Friday, I showed how CoexEdit handles tabbed tables in the standard 8.5.2 xPages discussion without requiring design changes. Stephan Wissell suggested that I tackle inline attachments next, so I posted about how they can be handled better. Both are from the Top 10 enhancements people want to see in the CKEditor according to Mary Beth Raven. I figured each business day I would go through and show how CoexEdit can fix CKEditor without touching it in any way. If there are any of those ten you would like to see more about, post a comment. Otherwise, I'll just pick one at random. I know I am not exactly fixing CKEditor, but instead fixing its use with this feature in web coexistence. Sometimes, that will also fix CKEditor, but there is a distinction. Also, there are four items (spellcheck, automatic correction, Permanent pen and automatic capitalization) which are editor behaviors, so I'll skip those and put in four other features important to web editing coexistence, trying to synch them up with the four features I can't directly fix.. 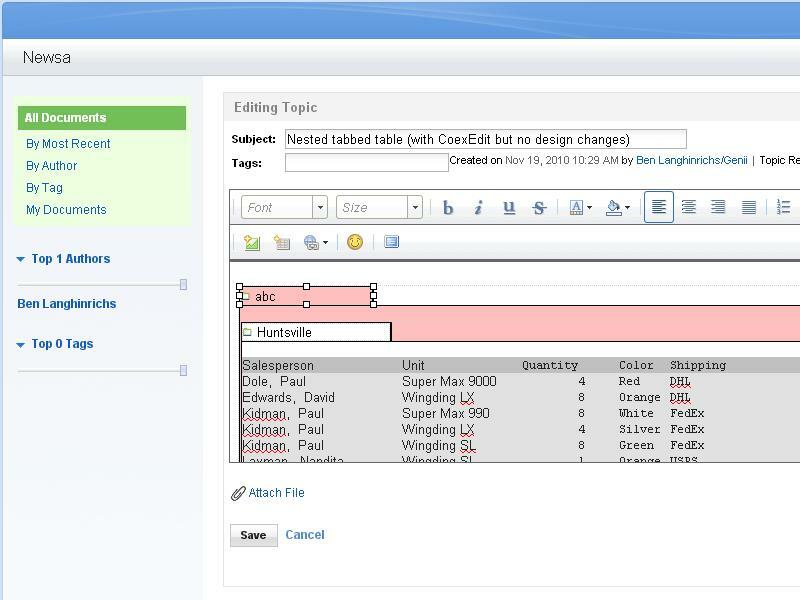 In this series of screenshots, I am using CoexEdit in its "no design change" mode, meaning that I create a database based on IBM's Discussion: Notes & Web (8.5.2) template unmodified. I make no changes to the design at all. An administrator without Designer could install and implement this solution. In keeping with this series, I am going to show the fixed version first, so those of you who already know what the current version is like can just see the first few slides. Since my blog cuts the images off, click on any one to pop that image into its own window. Figure 1: Document in CKEditor with three attached files (CoexEdit turned on). The (See attached file: 'try.odt') was added manually for now, but is automatic when the file is attached in Notes. Figure 2: Document saved in CKEditor with three attached files (CoexEdit turned on). Figure 3: Document edited in Notes has attachments replacing the "See attached..." text (CoexEdit turned on). 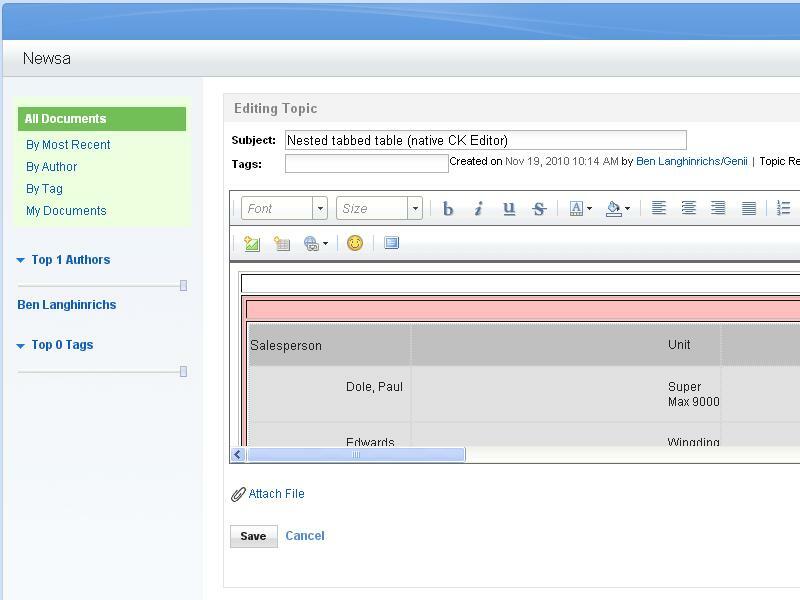 Figure 4: Document back in CKEditor with all three attachments (CoexEdit turned on). Figure 5: Document in CKEditor with three attached files (no CoexEdit). Figure 6: Document saved in CKEditor only has two attached files (no CoexEdit). Figure 7: Document edited in Notes with only two attached files (no CoexEdit). Figure 8: Document edited in Notes with all three manually attached files in place (no CoexEdit). 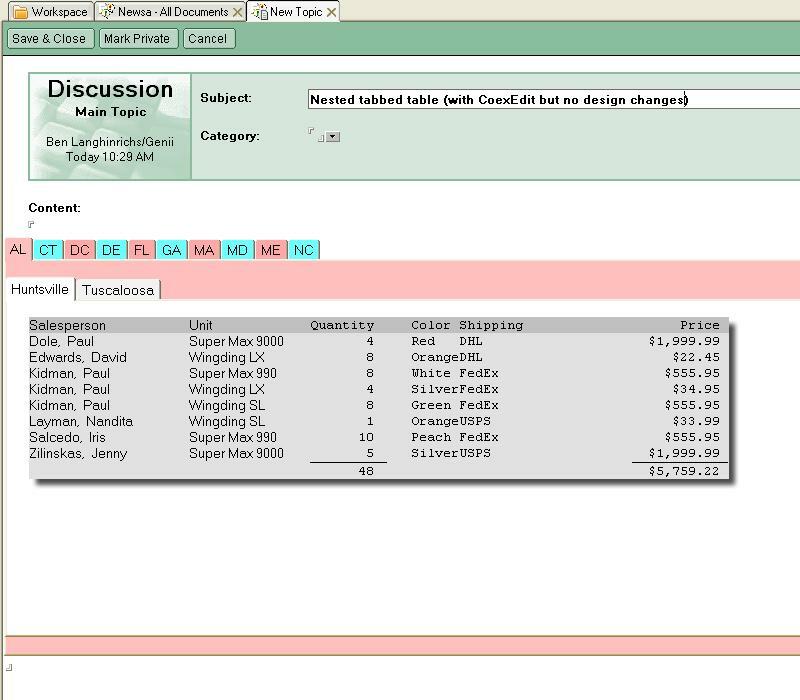 Figure 9: Document edited in CKEditor on web with all three attached files (no CoexEdit). Figure 10: Document in Notes only has two attached files, but "See attached..." for three (no CoexEdit). Figure 11: Document in CKEditor after edit/saves in both a few times with lots of "See attached..." (no CoexEdit). Any requests for Day 2 of my 'CKEditor fixed' series? 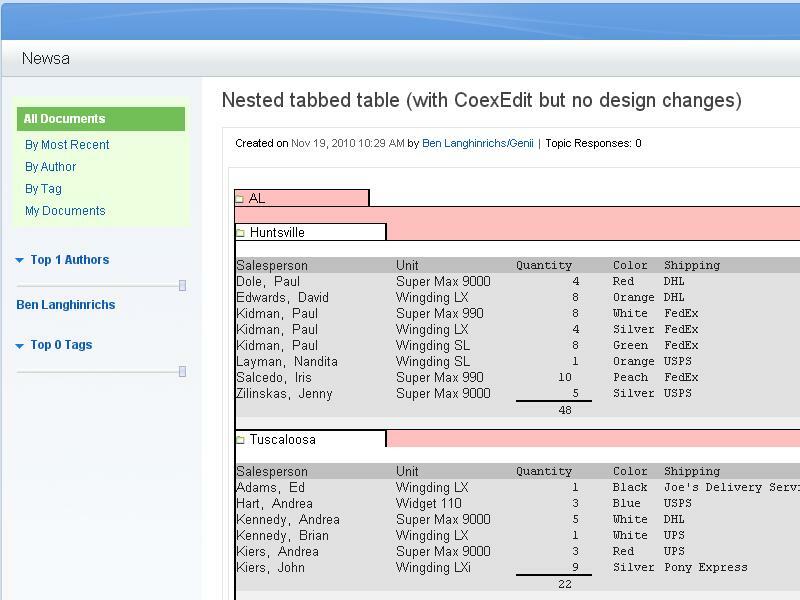 On Friday, I showed how CoexEdit handles tabbed tables in the standard 8.5.2 xPages discussion without requiring design changes. 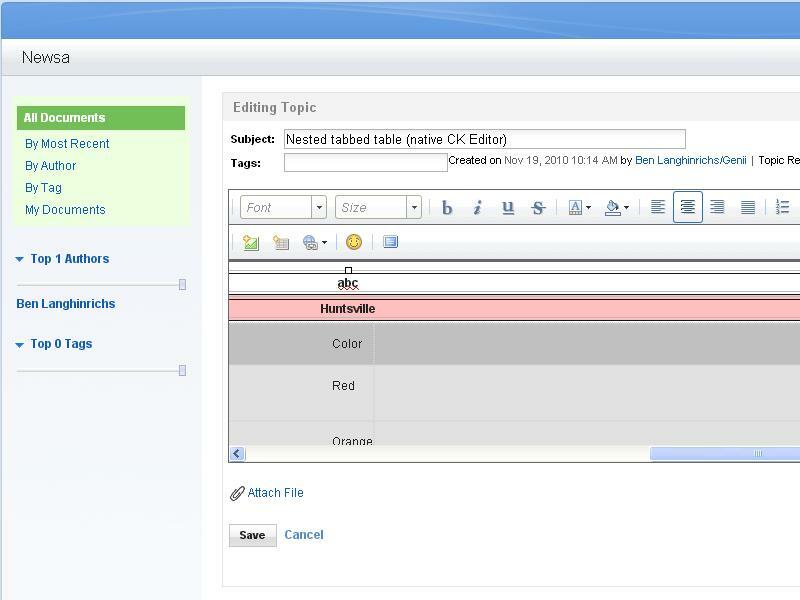 Tabbed tables are one of the Top 10 enhancements people want to see in the CKEditor according to Mary Beth Raven. I figured each business day I would go through and show how CoexEdit can fix CKEditor without touching it in any way. If there are any of those ten you would like to see more about, post a comment. Otherwise, I'll just pick one at random. Incidentally, I want to be clear that I know I am not exactly fixing CKEditor, but instead fixing its use with this feature in web coexistence. Sometimes, that will also fix CKEditor, but there is a distinction. Also, there are three items (spellcheck, automatic correction and automatic capitalization) which are editor behaviors, so I'll skip those and put in three other features important to web editing coexistence. I have made a few snarky posts about Domino 8.5.2 and the embedded CKEditor, but I am in the business of fixing problems, not casting blame. Therefore, here is my first fix for one of the Top 10 enhancements people want to see in the CKEditor that Mary Beth Raven identified, tabbed tables. 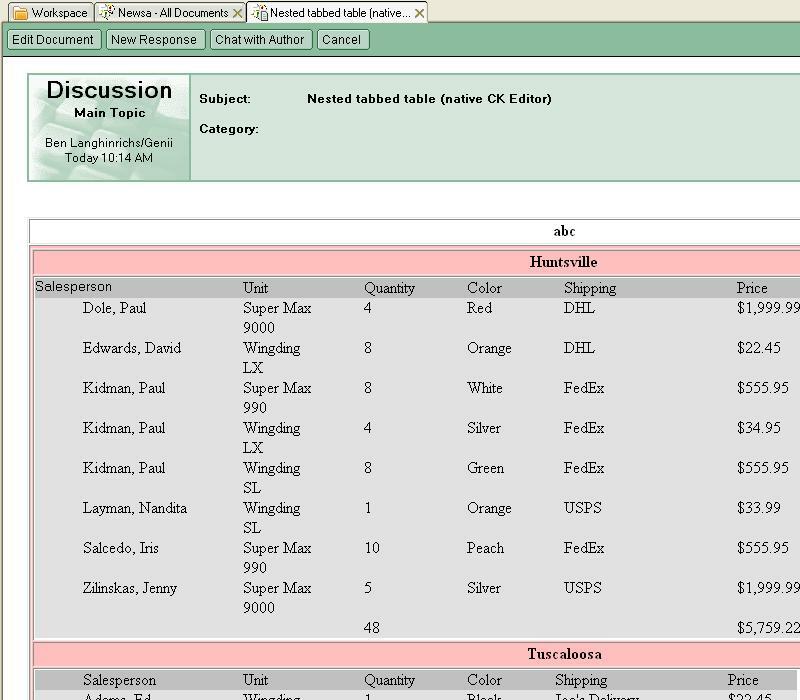 Just to be a show-off, I use nested tabbed tables. To be clear, my fix requires our software product. 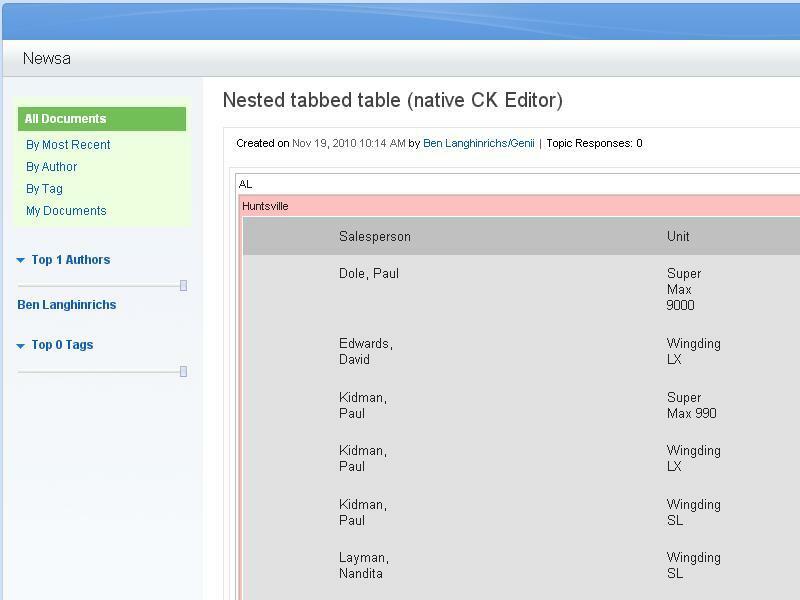 In this series of screenshots, I am using CoexEdit in its "no design change" mode, meaning that I create a database based on IBM's Discussion: Notes & Web (8.5.2) template unmodified. I make no changes to the design at all. An administrator without Designer could install and implement this solution. As a change from my previous posts, I am going to show the fixed version first, so those of you who already know what the current version is like can just see the first few slides. 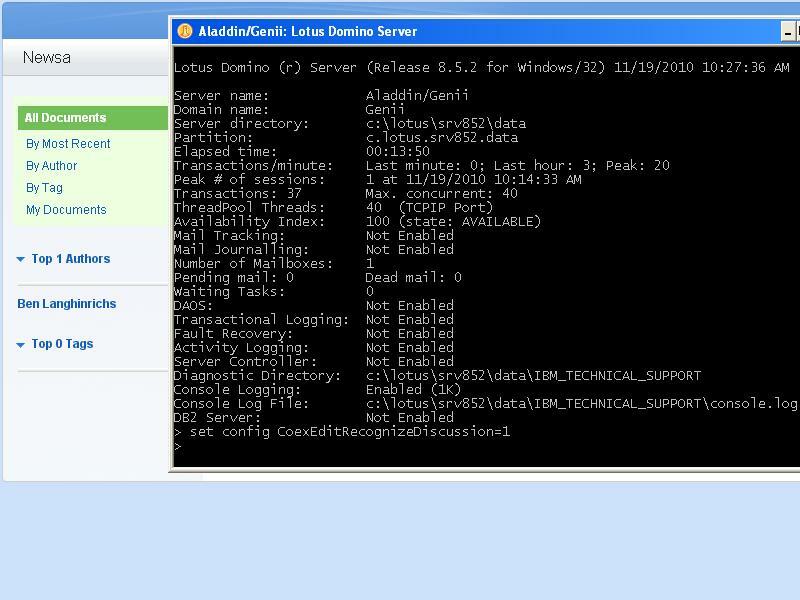 Figure 9: Only Admin change required to go from "no CoexEdit" to "CoexEdit turned on"
Sorry about the typo in the title earlier. 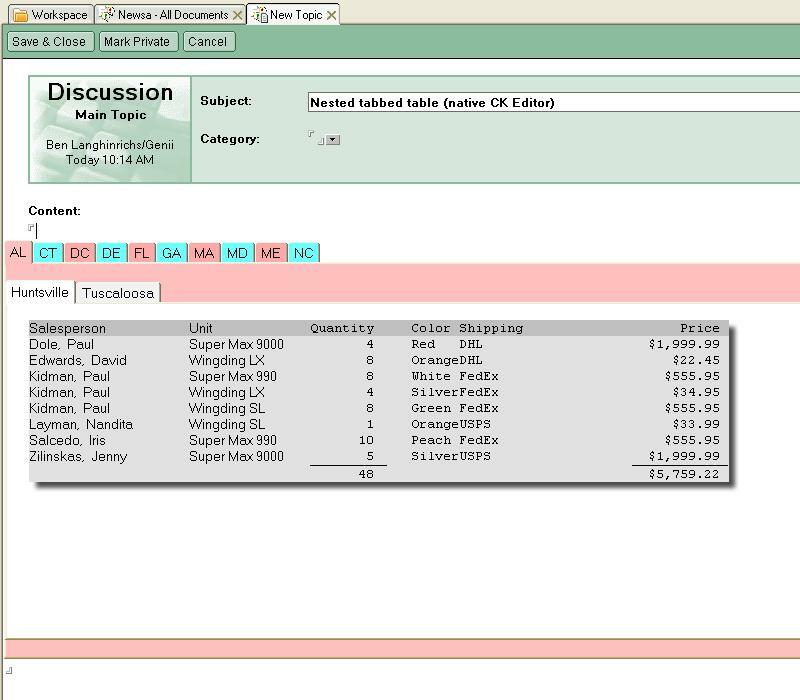 A customer asked whether it was possible to use our Midas Rich Text technology to search through rich text, inside tables, in different fonts and with different attributes, and replace a specified pattern with a string of X's. and that's all it takes. We could make it easier, but we'd probably have to read your mind. My recent examination of the Notes/Domino 8.5.2 combined discussion database confirms a prediction a number of folks have made, that IBM wants an xPages-only future. Even the simplest web to Notes rich text conversions have been ignored (hint to the IBMers, in the CKEditor config file, check on quotes around the font names with spaces like Lucida Sans Unicode). Stephan Wissel points out that a change to the Launch properties will make the Notes client use xPages too. Hence the TSA comparison. For those who don't know, the TSA is the authority tasked with security at airports in the United States. Poorly paid, poorly trained, but given massive power over the civil liberties of travelers, these men and women are supposed to stop terrorists by checking your name, frisking, scanning and stripping (if need be), but without any hint of profiling or actually looking at the suspects, er, passengers. Carry a gun into security, andd they are supposed to make you drop it in a bin, but not stop you from boarding. The suspicious Somali man with the name Fred Rogers is waved through, while the six month old child in a stroller whose name matches a watch list is stopped. Insane, but any inconvenience, any expense, any delay is justified rather than have TSA take advice from the Israelis, for example, who seem to have a clue or two about security on their airlines. Don't fix the process, put the pain on the users. 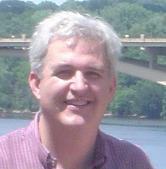 IBM has had numerous problems with conversion of HTML to rich text and vice-versa. Most of its problems are easy to fix. A few are difficult. But instead, IBM is happy to add any inconvenience, any expense, any delay, even cripple its Notes client completely, rather than either buy technology (such as mine) or develop technology to make the solution easier. In other words, they want the capabilities the Notes client has had for years. But because IBM doesn't want to bother fixing a problem that I, by myself, have fixed fairly well, they want you to give up these and more (such as adding doclinks, adding buttons, running agents, copy and pasting documents, easily acting on sets of documents, etc.) so that they are saved a bit of effort. Really, IBM? You want to be more like the TSA?